For other uses, see His Master's Voice (disambiguation). For the entertainment retailer, see HMV. 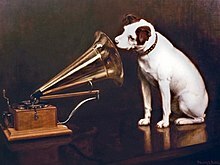 In early 1899, Francis Barraud applied for copyright of the original painting using the descriptive working title Dog looking at and listening to a Phonograph. He was unable to sell the work to any cylinder phonograph company, but William Barry Owen, the American founder of the Gramophone Company in England, offered to purchase the painting under the condition that Barraud modify it to show one of their disc machines. Barraud complied and the image was first used on the company's catalogue from December 1899. As the trademark gained in popularity, several additional copies were subsequently commissioned from the artist for various corporate purposes. Emile Berliner, the inventor of the Gramophone, had seen the picture in London and took out a United States copyright on it in July, 1900. The painting was adopted as a trademark by Berliner's business partner, Eldridge R. Johnson of the Consolidated Talking Machine Company, which was reorganized as the Victor Talking Machine Company in 1901. Victor used the image far more aggressively than its UK affiliate, and from 1902 most Victor records had a simplified drawing of Barraud's dog-and-gramophone image on their labels. Magazine advertisements urged record buyers to "look for the dog." In British Commonwealth countries, the Gramophone Company did not use the dog on its record labels until 1909. The following year the Gramophone Company replaced the Recording Angel trademark in the upper half of the record labels with the Nipper logo. The company was not formally called HMV or His Master's Voice, but rapidly became identified by that term due to the prominence of the phrase on the record labels. Records issued by the company before February 1908 were generally referred to by record collectors as G&Ts, while those after that date are usually called HMV records. The image continued to be used as a trademark by Victor in the US, Canada, and Latin America. In 1929, the Radio Corporation of America (RCA) purchased the Victor Talking Machine Company. In British Commonwealth countries (except for Canada, where Victor held the rights) it was used by various subsidiaries of the Gramophone Company, which ultimately became part of EMI. The trademark's ownership is divided among different companies in different countries, reducing its value in the globalised music market. The name HMV was used by a chain of music shops owned by HMV, mainly in the UK, Ireland, Canada, Singapore, Australia, Hong Kong, and Japan. In 1921 the Gramophone Company opened the first HMV shop in London. RCA purchased the Victor Company in 1929 and with it a major shareholding in the Gramophone Company, which Victor had owned in part since 1920. RCA was instrumental in the 1931 creation of EMI, which continued to own the His Master's Voice name and image in the UK. In 1935, RCA Victor sold its stake in EMI but continued to own the rights to His Master's Voice in the Americas. HMV continued to distribute Victor recordings in the UK and elsewhere until 1957, when EMI purchased Capitol Records as their distributor in the western hemisphere. The hostilities between the US and Japan during World War II led RCA Victor's Japanese subsidiary, the Victor Company of Japan (JVC), to become independent, and today the company is still allowed use of the "Victor" brand and Nipper trademark in Japan only. In 1968, RCA introduced a modern logo and restricted the use of Nipper to Red Seal album covers. The Nipper trademark was reinstated to most RCA record labels in the Western Hemisphere beginning in late 1976 and was once again widely used in RCA advertising throughout the late 1970s and 1980s. In the early 1980s, the dog reappeared for a time on RCA television sets and was also used on the ill-fated RCA CED videodisc system. EMI owned the His Master's Voice label in the UK until the 1980s, and the HMV shops until 1998. In 1967, EMI converted the HMV label into an exclusive classical music label and dropped its POP series of popular music. HMV's POP series artists' roster was moved to Columbia Graphophone and Parlophone and licensed American POP record deals to Stateside Records. The globalised market for CDs pushed EMI into abandoning the HMV label in favour of "EMI Classics", a name they could use worldwide; however, it was revived between 1988 and 1992 for Morrissey's recordings. The HMV trademark is now owned by the retail chain in the UK. The formal trademark transfer from EMI took place in 2003. The old HMV classical music catalogue is now controlled by the Warner Classics unit of Warner Music Group. Reissues of HMV pop material that EMI previously controlled are now reissued on Warner's Parlophone label. In the UK, Warner Classics's online presence was launched as 'Dog and Trumpet' on Spotify, Facebook, Twitter and Instagram in January 2017. The dog-and-gramophone image is now licensed by RCA Records and its parent company, Sony Music Entertainment, from Technicolor SA, which operates RCA's consumer electronics division (still promoted by Nipper the dog). Thomson SA acquired the division from General Electric after GE absorbed the RCA Corporation in 1986. The image of "His Master's Voice" exists in the U.S. as a trademark only on radios and radios combined with phonographs; the trademark is owned by RCA Trademark Management SA, a subsidiary of Technicolor. With that exception, the "His Master's Voice" dog-and-gramophone image is in the public domain in the U.S., its trademark registrations having expired in 1989 (for sound recordings and phonograph cabinets), 1992 (television sets, television-radio combination sets), and 1994 (sound recording and reproducing machines, needles, and records). The "His Master's Voice" logo was used around the world, and the motto became well known in different languages. In Europe these include "La voix de son maître," (France), "La voz de su amo" (Spain), "A voz do dono" (Portugal), "La voce del padrone" (Italy), "Die Stimme seines Herrn" (Germany), "Husbondens Röst" (Sweden), "Głos Swego Pana" (Poland), "Sin Herres Stemme" (Norway) and "Sahibinin Sesi" (Turkey). On 1 April 2007, HMV announced that Gromit, the animated dog of Wallace and Gromit, would stand in for Nipper for a three-month period, promoting children's DVDs in its UK stores. The 1958 LP album cover of Elvis' Golden Records shows pictures of various RCA 45s with Nipper on their labels. On the British version, these images were blacked out for copyright reasons. This type of editing took place with many other RCA releases in England. Similarly, the album covers and some labels of EMI imports which were sold in the U.S. often had a sticker placed over the Nipper trademark. In the 1946 Warner Bros. Looney Tunes cartoon Daffy Doodles, Daffy Duck is a "mustache fiend" who draws mustaches on advertising signs, including one of "His Master's Voice". The movie Superman Returns (2006) contains a scene early on set in Kansas, in which a "His Master's Voice" radio is clearly shown. His Master's Voice radios have never been sold in the U.S., due to RCA holding the "Nipper" copyright. The movie was made in Australia, and the nearest "prop" was obviously used. In the 2008 film Valkyrie, a Deutsche Grammophon recording of "Ride of the Valkyries" with Nipper and the "Die Stimme seines Herrn" motto on the label was shown spinning on a 78-rpm wind-up gramophone as the music played in the protagonist's living room. Homage is paid to the iconic dog-and-gramophone image in the 1999 feature film Wild Wild West in which a dog resembling Nipper runs to the side of a recently departed character and looks into an ear horn. The film, however, is set in 1869, 30 years before Barraud created his work. Staffers at the US public media organization NPR (National Public Radio) noted the similarity of sound between NPR and 'Nipper', and informally adopted the Nipper dog as a mascot. For several years in the 1990s a larger-than-life-size plastic statue of the dog Nipper graced the main entrance lobby of the network's headquarters building in Washington, DC. And the FaceBook group of ex-employees of the network is known as "Former Nippers." EMI continued to expand internationally through the 1990s. The name HMV is still used by the chain of entertainment shops founded by the Gramophone Company in the UK and, until 2017, in Canada. In 1998 HMV Media was created as a separate company, leaving EMI with a 43% stake. The firm bought the Waterstones chain of bookshops and merged them with Dillons the UK booksellers. In 2002 it floated on the London Stock Exchange as HMV Group plc, leaving EMI with only a token holding. HMV shops in Australia, Ireland, and the UK also use the Nipper trademark. HMV applied for trademark status in order to use Nipper at HMV stores in Canada but in 2010 abandoned the application, presumably because the rights to Nipper in Canada are part of the RCA brand portfolio now owned by Technicolor SA and licensed to other companies. As of August 2006, there were over 400 HMV stores worldwide. The website is operated by HMV Guernsey. On 15 January 2013, HMV Group plc entered receivership; stores in Ireland closed 16 January 2013 and were no longer accepting vouchers. The HMV website posted a receivership notice and no further online sales were made. According to the HMV website, the organization was restructured by Hilco and, while some stores were closed, it has reopened debt-free and continues to trade. As of 28th December 2018, HMV has confirmed that it has called in KPMG as administrators and entered administration for the second time in six years. Barnum, Fred (1991) His Master's Voice in America. Southall, Brian (1996) The Story of the World's Leading Music Retailer: HMV 75, 1921-1996. ^ Rye, Howard (2002). Kernfeld, Barry (ed.). The New Grove Dictionary of Jazz. 2 (2nd ed.). New York: Grove's Dictionaries Inc. p. 249. ISBN 1-56159-284-6. ^ "The Nipper Saga". Archived from the original on 24 September 2015. Retrieved 27 May 2006. ^ HMV shops in Canada and Japan were not allowed to use Nipper for these reasons; nor did the shops HMV operated in the United States in the late 1990s and early 2000s. ^ Billboard - Google Books. Books.google.com. 11 November 1967. Retrieved 28 February 2013. ^ "Trade Mark Details as at 28 February 2013: HMV Group plc". Patent.gov.uk. Retrieved 28 February 2013. ^ "CLAUDE DEBUSSY // Vladimir Horowitz: Complete HMV Recordings 1930-1951". Warner Classics. Archived from the original on 11 May 2018. ^ "At Abbey Road" – via Amazon. ^ "Gramophone - May 2017". reader.exacteditions.com. Archived from the original on 30 July 2017. ^ Thomson SA bought the RCA trademarks, including Nipper in the Americas, from GE in 2003. ^ "Gromit steps into HMV logo role". BBC News. 1 April 2007. Archived from the original on 9 October 2007. Retrieved 4 May 2010. ^ "CANADIAN TRADE-MARK DATA: 1396181 - Canadian Trade-marks Database - Canadian Intellectual Property Office". Ic.gc.ca. Archived from the original on 5 December 2013. Retrieved 28 November 2013. ^ "HMV Adds Gaming". marketnews.ca. 28 August 2006. Archived from the original on 23 September 2006. Retrieved 13 September 2006. ^ "More Uncertainty for HMV". thedailyshift.com. 18 January 2013. Archived from the original on 28 March 2013. Retrieved 22 January 2013. ^ "Music retailer HMV calls in administrators". 28 December 2018 – via www.bbc.co.uk. This page was last edited on 10 February 2019, at 22:26 (UTC).